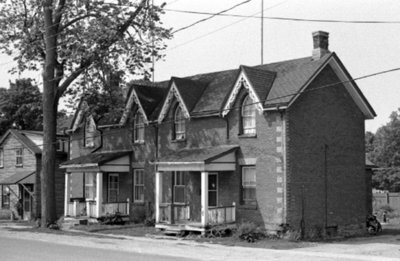 A black and white photograph of row housing on Euclid Street. There is a large tree to the left of the photograph. These row houses are located at 112-114 Euclid Street. This housing on the west side of Euclid Street was built by James Bradford Powell in 1877 and demolished in 1977. It was replaced by a modern apartment building. Row Housing on Euclid Street, July 1975, Brian Winter. Whitby Archives A2013_004_034A.